It’s a Cartoon. It’s a Music Video. It’s DEPRESSURIZATION! | The Killer Robots! It’s a Cartoon. It’s a Music Video. It’s DEPRESSURIZATION! Hey, it’s our new music video and it’s a cartooooooooon! 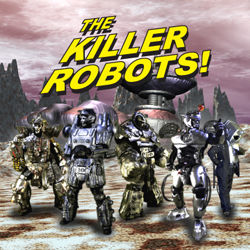 Be sure to check out our live action movie, The Killer Robots! Crash and Burn on Amazon, iTunes and Google Play. Also available as a DVD and Blu Ray.